The Grandfather Mountain Highland Games is perhaps the third largest Games in the United States of America, after the Pleasanton Scottish Games (largest attendance) and the Stone Mountain Games (second largest attendance). The Grandfather Mountain Games can never be any larger due to the physical size of the McRae Meadows area, just below the peak of Grandfather Mountain. There is, however, something special about these games in the mountains of North Carolina. Clan Sinclair, in July 2004, made them even more special. The “advance party” for Clan Sinclair began to arrive on Monday, July 5, 2004 in preparation for the Games later in the week. The initial gathering was held at the house rented by Brad and Sindy Barker on Sugar Mountain. Sugar Mountain is a popular place for seasonal snow skiing as well as the enjoyment of the beautiful mountain areas most any time of the year. This gathering place proved to be ideal as we intruded upon the Barker’s many times over the coming days. They were most gracious hosts for the Clan. The advance party included the following: President Emeritus Brad Barker and wife Sindy, President Donald Sinclair and wife Gloria, and Secretary-Treasurer Mary Selver, Bud Howell (Mary’s Brother) and his wife Brenda, and Lynne and me (Commissioner, North-South Carolina). Tuesday, Wednesday, Thursday, and Friday found more special guests arriving. We were all having a great time and spirits were high. After careful consideration, I will not elaborate further regarding high spirits. Western Vice President Gary Sinclair, his wife Mary, California Commissioner Chuck Sinclair, his wife Carolyn, Clan Sinclair Canada President Rory Sinclair, Jim and Kelley Thompson (two of Brad and Sindy Barker’s children), and of course, the Grandfather Mountain Games Honored Guest and our hereditary Clan Chief, Rt. Honorable Malcolm Sinclair, Earl of Caithness. Wednesday evening found Malcolm, Donald, Gloria, Lynne and me as guests of the Grandfather Mountain Games Board of Directors for a lovely evening at the local Country Club. We were seated at the table with the Chairman of the Games, Dr. Ronald McGowan. This was a very special night for the Board and their guests and we were very pleased to be a part of it. We received the warmest of welcomes from the hosts. The social and the dinner were exceptional. Many of the officers, event directors and others offered toasts for the evening. Our own Malcolm gave a most eloquent toast of recognition and appreciation that set the tone for the days to come. We were able to meet and socialize with those who were not only active with the games, but with those who had passed the torch to the current leaders. Time was also spent among those present reflecting on the visionaries who had preceded them and had gone on to that house not made with hands, eternal in the heavens. If ever there was/is a group of leaders with a common purpose, remembering their past, yet striving for more, it is, indeed these Scots of Grandfather Mountain. Throughout the days to come, we Sinclairs would come closer to understanding that this was not “just an event”. Dr. McGowan, Board Member Ms. Agnes Woodruff, President Ross Morrison, General Manager Frank Vance and many others will never be forgotten by Clan Sinclair. An appreciation must also go to Donovan Murray for his diligence, as Concert Production Manager, working with Isla St. Clair’s production manager, Patrick King, overcoming obstacles to make arrangements for her visit from Scotland and her performances at the Games. It was unique for the Honored Clan to also have such a talent as Isla and piper John Spore, performing on stage each day. The “Advance Party” made final preparations on Thursday, with Mary Selver leading the charge to assemble a colorful and informative Clan Tent display. Thanks, Mary for this huge effort that attracted many to our Clan tents. A special thanks to Mary for all that she does for the Clan, much of which is “behind the scenes”. Thursday evening brought the Torchlight Ceremony, the first of the public festivities for the Games. President Donald Sinclair took to the field to represent Clan Sinclair in the “Raise the Clans” ceremony. This ceremony was created in 1995 by SMOTJ member (Knights Templar) Larry Long for the Grandfather Mountain Games. In days of old, “Raise the Clans” was, of course, used to summon the clans for battle. This night-time ceremony creates a “living cross” of light forming a saltire cross (Scotland’s ancient symbol) made up of a representative from each of the clans and families who came to participate at the Games. The four corners of the saltire cross represent the compass points to indicate the widespread migration of Scots. “As the torches burn brightly together in the gathering dusk, the haunting sound of pipes is carried into the night. The clans have come again to celebrate who they are.” (Paraphrased and with the quote from the 2004 GMHG program). Friday morning arrived and there was a hustle and bustle as we prepared two tents for our Honored Clan. Where does this go? Where do we put that? It all worked out great and soon the tent was in good order. Chief Malcolm kicked off the opening of the games with a brilliant performance. For those who have spent time with Malcolm, this was no surprise, however to find someone of Malcolm’s stature, charm, eloquence of tongue, and his unique humor was not expected by those in the Reviewing Stand. Malcolm was a hit! Of course, Malcolm opened the Games each day. By Sunday, one of the officials said that she wanted to join our family! I must add at this point that our very own Ron Sinclair opened the Games each day with his booming, beautiful voice, singing our National Anthem. Ron, what a great job! Friday’s Games were very well attended; in fact, the officials said that it was a record attendance. The Clan Sinclair tent was very busy with cousins and visitors. We were very fortunate to have such talent and knowledge at the Sinclair Tent during the three days of the Games. Generally, that is where I spend my time, however, this year, I simply stayed out of the way! Friday night brought another very special event, the Sponsor’s Banquet. Two tables had been reserved for Clan Sinclair, front and center, with the Board officials at tables on each side of us. It was a real treat to be able to see and visit with them again. The Sponsor’s Banquet is very well done with heavy hors d’oeuvres, plenty of refreshments, and entertainment galore. After the piping, a pipe-brass band brief concert, country dancing exhibition, and a song or two by emcee Alex Beaton, brief remarks were made by a few of the officers present. Malcolm was asked to share some brief remarks and was presented with the Grandfather Mountain Games Tartan blanket. I can say that, without exception, all present had a good evening. We danced, laughed and found time to enjoy the company of cousins who were to become more than “only” clan members. We became friends by the end of the week. I am not making this comment lightly. It was truly a week of friendship and the bonding of some lasting relationships. I must say that Saturday came very early and it was time to get to the mountain, reset the tents, and prepare for the opening of the games once again. True to form, as the Chief gave his opening remarks, he once again captivated the group with his message and humor. Once again, Ron Sinclair sang a beautiful rendition of our National Anthem. Chris St. Clair participated in the heavy athletics as a professional for the first time and did well, particularly in the Caber Toss and the 16 pound Clackneart. Saturday is the busiest of times at the Games. The Chief not only welcomed visitors at the tent but also continued his process of stopping by to greet and briefly chat with all clans at their tents. What a tireless leader we have. Two newspapers interviewed the Chief, one of which was the Wall Street Journal. A clan meeting was held with messages from our Secretary/Treasurer, Mary Selver; President, Donald Sinclair; and our Chief, Malcolm Sinclair. Saturday evening was THE big event, our Clan Sinclair Banquet. My gratitude and appreciation go to Sindy Barker who was responsible for this event. She did the planning, preparation and coordination for the Banquet. Of course, earlier in the year we talked on numerous occasions as she made me feel as though I was actually contributing. Thanks, Sindy for making this a tremendous success. The setting was at the Barker’s rental house and the weather cooperated beautifully. The evening was everything one could expect with Isla St. Clair entertaining as only she could. Thanks Isla, for giving of your time and sharing a bit of yourself with us. We also enjoyed Rory and Piper John Spore, (who performed with Isla at the Games), as they piped in the Chief as he prepared to present the Haggis. Rory gave an explanation of the Burns’ To a Haggis, followed by Malcolm who did the honors, Burns’ style. During the evening, a very special award was presented. Past President Brad Barker was presented with a “Lifetime Membership Award”. He very deservingly received a standing ovation. Brad has done a lot for the Clan and is an inspiration to us all. Hats off to you, my friend, for a job well done. Brad continues to play an important role in the clan and over the years I have personally been blessed by his wise counsel. We all had such a good time at the Banquet and it was so very special to see “cousins” getting to know each other better and building relationships that will no doubt carry us into the future. As I recall there was little time between the end of the banquet and Sunday morning. Sunday was very busy with the Opening of the Games and the various festivities, including the Kirkin’ o’ the Tartan and Parade of the Tartans. Speaking of the Opening of the Games, the Chief and I (as his standard bearer) proceeded to the assembly area as the official Guests/Officers were to be piped across McRae Meadows to the Reviewing Stand. What? No Pipe band? There was a slight mix-up on Sunday morning regarding the time and there was no band to pipe us across the field. Problem? Never. Did you carefully read paragraph two of this article? Did you see that Rory Sinclair was present? A quick thinking Chief calmly informed this illustrious group to “have no fear, Clan Sinclair is here.” Well, he didn’t exactly say it like that, but I got the message, hurriedly found Rory, told him to gather his pipes, and informed him that he was to pipe the group to the reviewing stand. He tuned the pipes on the run and proceeded to pipe us across the field for the initial opening of the Games. Our very own Rory Sinclair saved the day. Of course, later in the day when the massed bands marched by, Rory, ever so cleverly, “merged” into the center, with that devilish twinkle in his eye. Rory, my friend, you are special. Many photos were also taken, including the “Kilted Sinclairs”. Yes, it was again very busy and visitors continued to stop by the tent, but somehow things were quite different. We all lingered a bit longer when chatting; we seemed to be asking each other a few more questions, perhaps questions which we knew the answers. It was becoming a reality that this wonderful time for so many cousins and friends was quickly coming to a close. Cousins from Texas, Virginia, the Carolinas, Tennessee, Georgia, Illinois, New Hampshire, Florida (Eastern Vice President Sinclair Franz and his wife were in attendance), and elsewhere were beginning to say their goodbye’s. The Grandfather Mountain Games were coming to a close. Most of the “advance party” remained until the following morning and more was planned for the evening. On Sunday evening we attended the Scottish Heritage Society social and mingled a little more among those of a like mind, after which we decided to feast once again. Our last dinner together was memorable with our cousins from California to New Hampshire, from Florida to Canada, and, of course, our guest of honor, Malcolm. We had a fantastic evening and continued to learn more about each other. My job during the Games was to accompany Malcolm and make sure that he arrived at the proper place a t the appointed time. What a treat for me to be able to observe our Chief’s leadership, his wit, and above all …. his heart. Knowledge is important, but it is the heart that binds us. From the Chairman of the Games on down the line, there is no doubt in my mind that Clan Sinclair made a difference at the 2004 Grandfather Mountain Games. Malcolm touched us all. Thank you, Malcolm, for being “you”. Families are very interesting. Each of us, as part of a larger family, is blessed with our own set of strengths, as well as areas in which we can develop further. By recognizing and capitalizing on the diversity that comes with our humanity, therein lies our strength. It is clear to me that our Clan is strong and has enormous potential. With each person contributing his or her talents, our clan can continue to grow and prosper. By spending time with those of you from different geographic areas, I learned a great deal about “how things are” in different areas. I also saw the excitement, the energy, and the caring for one another. My cousins, we are a special “family” indeed. However, there are many other Sinclairs who know little or nothing about our Clan. We must find ways to reach out to them. We must also reach out to each other, to continue to learn, to grow, and ultimately to have a richer life by knowing “from whence we came”. We know that such heritage can yield generations of forward thinking, aspiring individuals who have the ability and yes, the duty, to bring together this most noble name, the name Sinclair, for our children and our children’s children, to appreciate and to build upon. As this Highland Games season is quickly coming to a close, I am rededicating myself to more and better service to Clan Sinclair. Let us all step up with our ideas, our energy, and our God given talents and abilities to make 2005 the very best ever. 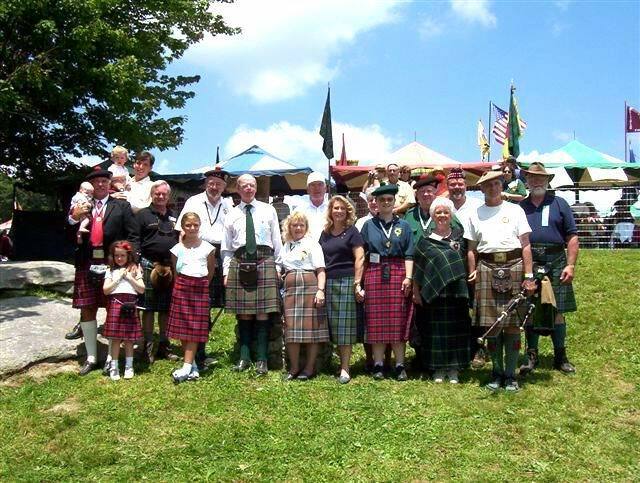 Thanks for allowing me this time and space to endeavor to express the great time and fellowship that I believe many of us experienced at the Grandfather Mountain Highland Games 2004. I’m excited as I know that I’ll continue to read from others, the ongoing chapters of Clan Sinclair. Reference Grandfather Mt. Highland Games Day-by-day Photos by clicking on this link.